Situated in the midst of western ghats of chikmagalur district, surrounded by lofty hill ranges of bababudanagiri, River Tern Lodge is a perfect blend of nature & wildlife. It is located on a hillock, at the pictureseque bhadra river, near lakkavalli and close to bhadra tiger reserve. Bhadra wildlife sanctuary boasts of rich avian life with birds like grey junglefouwl, red spurfowl, painted bush quail, emerald dove, black woodpecker etc. Huge marsh crocodiles and monitor lizards are a common sight here. Gaur and leopards are also spotted. This sanctuary is adopted under " Project Tiger". Activities: Wildlife viewing through bhadra tiger reserve, boat ride, water based activities like sailing, kayaking, water cycle, water trampoline, joy fishing are all possible. A few others in the vicinity are visit to tyverekoppa lion & tiger safari and sakkrebyle elephant camp, bird watching, mountain biking. Season: Generally plesant throughout the year. Monsoon makes the place lush & green. Summer would be slightly warm. 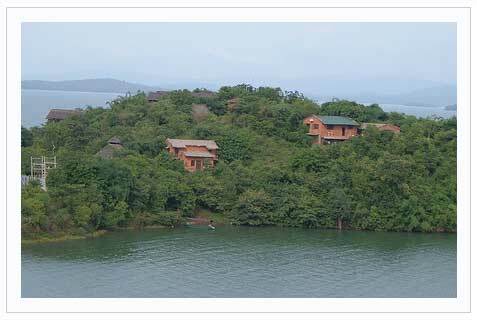 Cost includes stay, all meals, jeep safari into bhadra tiger reserve, boat ride, forest entry fees, camera fees & taxes. Single occupancy charges will be Rs. 5050 per room for indians & 7750 per person for foreigners. Water sports is at extra cost. Bangalore - Tumkur bye pass to shimoga - Gubbi - Tiptur - Arsikere - kadur - Birur - Tarikere. At Tarikere take left to travel to lakkavalli ( 14 kms). At Lakkavalli you will find a sign board to the River Tern Lodge. River tern lodge is 38 kms from Shimoga.